Centuries ago, European farmers would seal the wood on their barns with an oil, often linseed oil — a tawny-colored oil derived from the seed of the flax plant. They would paint their barns with a linseed-oil mixture, often consisting of additions such as milk and lime. The combination produced a long-lasting paint that dried and hardened quickly. (Today, linseed oil is sold in most home-improvement stores as a wood sealant). Now, where does the red come from? •Wealthy farmers added blood from a recent slaughter to the oil mixture. As the paint dried, it turned from a bright red to a darker, burnt red. •Farmers added ferrous oxide, otherwise known as rust, to the oil mixture. 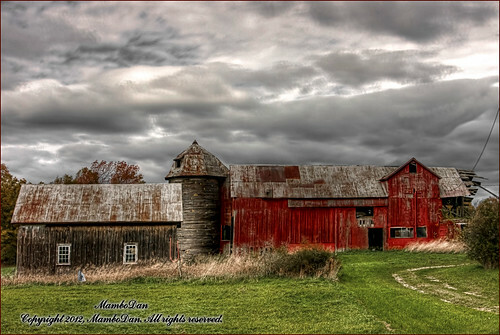 Rust was plentiful on farms and is a poison to many fungi, including mold and moss, which were known to grown on barns. These fungi would trap moisture in the wood, increasing decay.